Economic development and exploitation of Nature were key focuses in the opening statements from official delegates to the Conference, while the causes of significant and increasing biodiversity loss were left off the agenda. “The main drivers of biodiversity loss are agriculture, infrastructure, extractivism, and the energy and manufacturing industries,” Marien said. The Convention has worked on including biodiversity consciousness into these industries through their "mainstreaming" efforts. However, so far what we are seeing is that this engages industry on their terms. 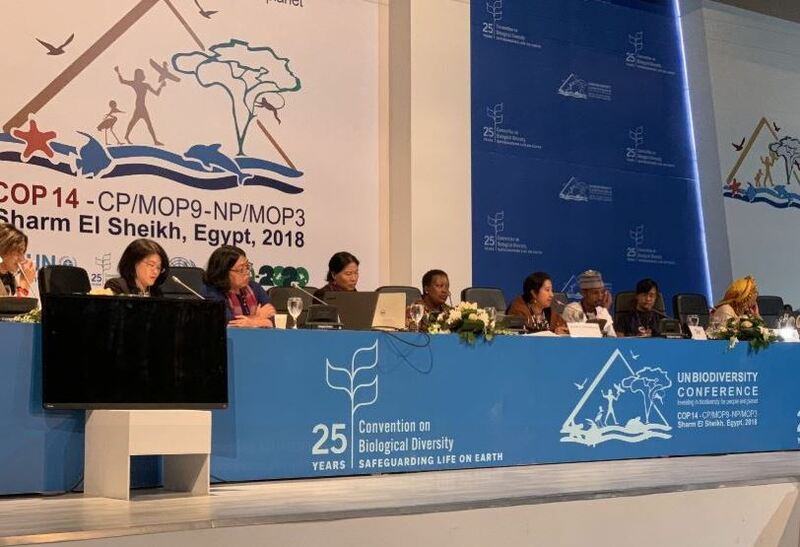 The Executive Secretary of the Secretariat of the Convention, Cristiana Pașca Palmer, noted the need for substantial growth of these industries in her opening statement. However, growth of destructive sectors is by definition incompatible with biodiversity conservation. Teddy Baguilat, President of the Indigenous and Conserved Communities Area Consortium (ICCA Consortium) said that indigenous peoples knew how to live in harmony with nature, by using no more than what they needed. He said indigenous peoples across the world were being attacked for protecting critical watersheds and territories from destructive development, which is threatening biodiversity. We must address the drivers of biodiversity loss now, because the poorest of the poor are the ones who feel the effects and suffer the most, said Simangele Msweli, from the Global Youth Biodiversity Network. The CBD Alliance, of which Friends of the Earth International is a member, called for an end to the corporate capture of Convention of Biological Diversity (CBD) negotiations. Delegates are being asked to celebrate the 25th anniversary of the entry into force of the Convention, but there is little to celebrate. Biodiversity has hugely declined, and while the slogan of the Conference is “investing in biodiversity”, there is exponentially more financial investment that destroys biodiversity than that saves it. Friends of the Earth International underlines that the new strategic objectives for biodiversity - which will be approved at the next Conference meeting in China in 2020 - needs to be a framework that ensures the world starts living within planetary boundaries. People and planet must be prioritized over economic development, and especially so over corporate interests. The agreement must be based on a participatory, bottom-up approach from local communities and those living with Nature. The failed model of voluntary pledges seen in the Paris Agreement should not be repeated here.